Hutcheson at work in the lab. Joshua Hutcheson is a graduate student in the Biomedical Engineering Department at the University of Arkansas. 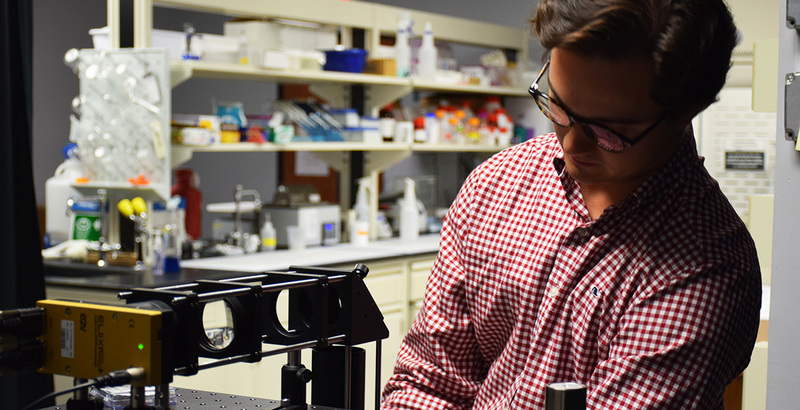 He is part of the research team at the University’s Translational Biophotonics & Imaging Lab, and a member of the UArk Biomedical Engineering Society. UArk BME: Have you always wanted to be an Engineer? What attracts you to Biomedical Engineering specifically? Hutcheson: Growing up I actually wanted to be a doctor. I went into the program pre-med with engineering as a fallback, and it has proven to be a good one! I chose engineering graduate school for a lot of reasons but one in particular is that I think Biomedical Engineers are going to have a major role in primary care in the coming decade due to the modernization of medicine. UArk BME: Recently, your research work was published in Review of Scientific Instruments. Can you discuss in layman’s terms what you reported in your paper, “A widefield fluorescence microscope with a linear image sensor for image cytometry of biospecimens: Considerations for image quality optimization” ? Hutcheson: I would be happy to! 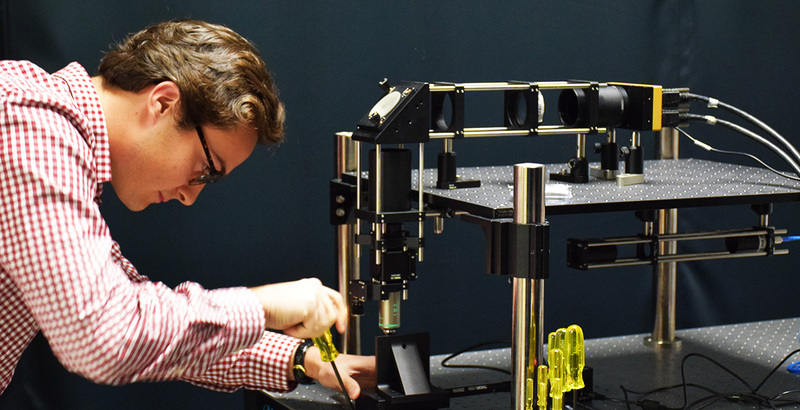 To begin, we built a microscope with a line scan camera for fast, seamless image processing. A line scan camera takes pictures of objects lines at a time, as they are translated by the image sensor, and the advantage to that is that it can transfer smaller amounts of data (i.e. the picture) at a time. We then wrote a code to recombine the individual lines into a cohesive image on the computer. The problem confronted in this paper was that there has to be a synchronization in the translation speed of the objects and the camera’s acquisition rate (how fast it takes pictures). After we presented adequate data towards that problem, we showed that the speed of this system has promising applications in the field of image cytometry. This is a research topic that uses images to classify and count large amounts of biological specimens. Hutcheson adjusts the light sheet confocal microscope. UArk BME: What’s next in your research? Hutcheson: Great question, I was actually working on the next project before that last paper cleared peer-review! We have been developing a collaboration with Dr. Ingrid Fritsch’s group in Chemistry/Biochemistry, in particular with the project of Foysal Khan, one of her graduate students. His project is a microfluidic device driven by magnetohydrodynamic (MHD) fluid flow. In layman’s terms, it’s a small chamber that uses magnetic force and chemical ions to control fluid flow, and we have been working on a paper to show that they can control the speed of fluid in their device to synchronize with our camera just like in the previous paper. We just submitted a patent application on the combination of these two technologies, and I got accepted to present our results in San Francisco at the beginning of next semester. I have also made some ground on another project of late, which we call, “whole slide scanning”. This project has been hugely accelerated by the outstanding work of one of my undergraduate researchers, Courtney Hunter. She just started this semester and has really taken off, and we actually just found out that Courtney has been awarded a SURF grant to work on whole slide scanning for the next year as a part of her thesis work under my supervision—exciting stuff! In short, whole slide scanning is a way to rapidly image a slide for pathological analysis; this project is going to hopefully be used to better enable clinical pathologists to streamline routine diagnostic tests. UArk BME: Earlier this year, you had the chance to present some of your research work at the 2015 SPIE Photonics West Conference in San Francisco. What was the best part of being able to attend this conference? Did anything surprise you? Hutcheson: I did! It was a great time, and I was really grateful for the opportunity! Apart from just being in San Francisco (it was my first time), I think the best part was gaining the understanding that what I do in the lab, day after day, actually does have a place in the world of research. Sometimes, as a new researcher, it is easy to lose sight of the application of your project, and I feel that wrapping everything up and presenting a finished product helps the researcher have a healthy perspective on that. With regard to what surprised me, the conference was pretty huge (San Francisco is a bit different from Fayetteville), so I was trying to get my bearings most of the time. One thing I did learn is that research is a very interconnected field. Dr. Muldoon introduced us to a lot of people that he has met and worked with during his career, which really benefits us (the graduate students) and is a great model for our own future career development. 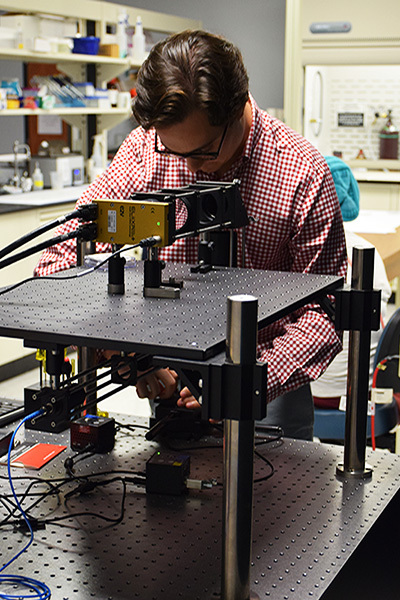 UArk BME: What’s it been like to work with Dr. Timothy Muldoon (the principal investigator of the Translational Biophotonics and Imaging Laboratory)? In what ways has he helped you in your research/career? Hutcheson: I could go on for a while about the supervision, mentoring, and research skills of Dr. Muldoon. If you have ever worked with Tim or taken one of his classes, you will probably find out that he is neurotic about email (in the best way possible, though!). He rarely goes a few hours without checking and replying to every unread email, and if he finds out that one of the graduate students has made contact with an outside connection (i.e. a supplier, collaborator, clinician, etc.) without him on the chain, then you will (promptly) be getting another email! I say this to demonstrate just how present and involved he is as a mentor, and how impeccable his communication skills are. On a personal level, he has helped me immensely with my scientific speaking and writing skills. He is not only focused on the research deadlines, but on developing his graduate students so that we are able to successfully transition into our next positions. We also end most meetings with some time to hang out and talk, whether it be about classes, interpersonal relationships, or just what we are doing that weekend. 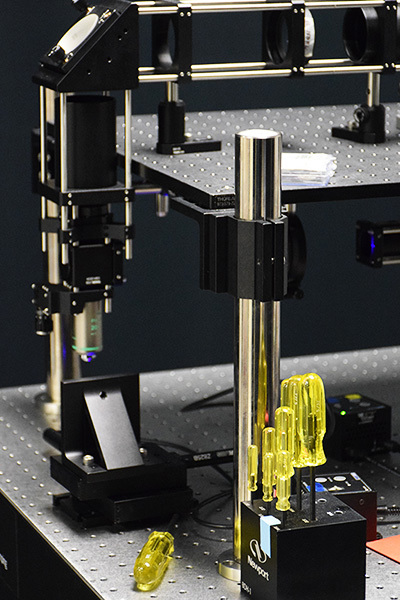 A closer look at the light sheet confocal microscope. UArk BME: More broadly speaking, what makes being a Biomedical Engineering at the U. of A. different than being one elsewhere? What sets this program apart? Hutcheson: As most know, our program is very new, and I think what some consider to be a weakness is actually our greatest strength. In the beginning stages of a program, there’s a lot that has to be set up, including IRB protocols, instrument facilities, etc. The upside to this is that the graduate students in this program get intimate exposure to how everything works, and the start-up process of the program’s infrastructure. In contrast, a graduate student who walks into a project that has been passed along for the last 10 years initially does not know how to troubleshoot when things go wrong. In contrast, if you build something with your own hands, you know what to do when it breaks. Therefore, I feel that the newness of the program makes our graduate students highly competitive candidates on the job market after they graduate. I would encourage any current or future graduate students of this program who are reading this to think long and hard about how to communicate your usefulness, in this way, to your future employers. Another benefit of our program are the professors. When searching for new faculty, the core faculty here makes it a point to bring together candidates that will fit in well with the culture. In a more high-profile program, you will not particularly have this benefit, because they are focused more on solely bringing in the researchers with the biggest grants and the best publications. This isn’t to say that we aren’t bringing in top talent; actually, it’s quite the opposite. Our staff’s curriculum vitae represent some of the top research programs in the country, including The Johns Hopkins, Rice University, Georgia Tech, Duke, and Tufts, to name a few. Though these credentials are important, I appreciate the fact that this program also values culture. I feel confident that this is a place where researchers enjoy their work, and a department with whom outside departments enjoy collaborating. UArk BME: As a member of the Biomedical Engineering Society (BMES) at the University, how important do you believe it is to bring in outside speakers to the Department, as BMES often does? Have any speakers you’ve seen been particularly influential, and/or do you have a dream speaker you’d love to bring to campus? Hutcheson: This is huge! A speaker gives exposure and stimulates collaboration amongst the labs. One presentation by Ben Noe and Sara Muldoon from Medtronic and St. Jude, respectively, comes to mind. These speakers were brought by the BMES, and I felt that their presentation answered a lot of questions that those of us in the BME program had. Ben Noe is the contact for the national BMES committee on academia to industry translation; in short, he helps graduating students get noticed by engineering firms. I felt that their presentation was very practical, and a way for students to build valuable contacts in the industry world. A dream speaker of mine would have to be Elon Musk, founder of Paypal, CEO of Tesla motors, CEO and Founder of SpaceX, and majority shareholder in SolarCity. This recommendation is purely selfish, as I just finished his biography, Elon Musk: Tesla, SpaceX, and the quest for a fantastic future by Ashlee Vance. I would highly recommend this book to any engineer. Though Elon is a “rough around the edges” public figure, he has absolutely stimulated my desire as an engineer to innovate in ways that are useful, and create new products that hugely impact the world. He challenges the supposed “brilliance” of products like Netflix (which encourages laziness) by disrupting the car industry, banking moguls, and the bureaucratic space industry; these disrupting technologies have flipped markets upside-down and challenged engineers not to waste their time and intelligence on useless products, but rather on truly changing the world. Hutcheson looks through the light sheet confocal microscope. UArk BME: You’re also a Teaching Assistant at the University, and have been for several semesters now. Is there anything you’ve learned from this experience that you perhaps didn’t expect? Hutcheson: Absolutely. Being a teaching assistant can be pretty difficult for graduate students sometimes, but it’s also seen as a “right-of-passage” of sorts. At first, I didn’t enjoy it much and saw it more as a graduation requirement. This semester has been significantly different than my other one, and I’ve actually learned that I like to teach a lot more when I inherently understand the topic. At present, I teach a lab for the Biomedical Signals and Systems class taught by Dr. Narasimhan Rajaram; this lab is based in a high- level coding software called MATLAB and we mostly work on signal processing. I’ve really enjoyed helping the undergraduate students understand how to use MATLAB for their benefit, and I hope they’ve learned enough from me that they can use it in the future. UArk BME: What advice would you give to an undergraduate engineer considering grad school? Any benefits you’d care to highlight? Hutcheson: There’s so much to say here, but I will try and stay brief. If you are considering graduate school then I would say that you absolutely need to start as an undergraduate researcher. It will give you a phenomenal start into understanding the inner workings of academic research. Moreover, if you are considering the choice between medical school and engineering graduate school, I would encourage you to take a serious look at the current industry as it pertains to health care and the future of primary care. I would by no means discourage a student going to medical school if that is truly what they want to do, but I would highly encourage students to be educated about present jobs on the market, and to get sufficient advice from other doctors, professors, and mentors about the future of the industry. Don’t simply continue to pursue medical school because it’s why you came to college in the first place. Personally, I believe that there will always be a place for doctors and there is an unbelievable market for specialists, but biomedical engineers and technologically driven health care will have an undeniably bigger role in primary care in our lifetime. In general, whichever direction you go, it’s important to be educated on the future of that industry; you need to take stock from all aspects. Don’t keep your head down and focus solely on good grades, test scores, and recommendations; be sure to also analyze critically where healthcare is going, how the leading politicians will litigate, and what firms will influence the world’s resources the most. Hutcheson: I probably won’t answer this like the typical engineer! * I automatically thought, “Well how long? Do items include people? Do I know for certain if there’s food?” Anyways, I will answer this to the best of my ability. If I can bring people, my three things would be my Bible, my wife, and a knife. If I can’t bring people, then my Bible, a knife and a fishing rod. *I’m also assuming you didn’t want answers like GPS tracker so people can find me! I figured I’d play along rather than cheating.